In Franklin, 1,157-foot Tunk Mountain looms over a sweetly nestled home. 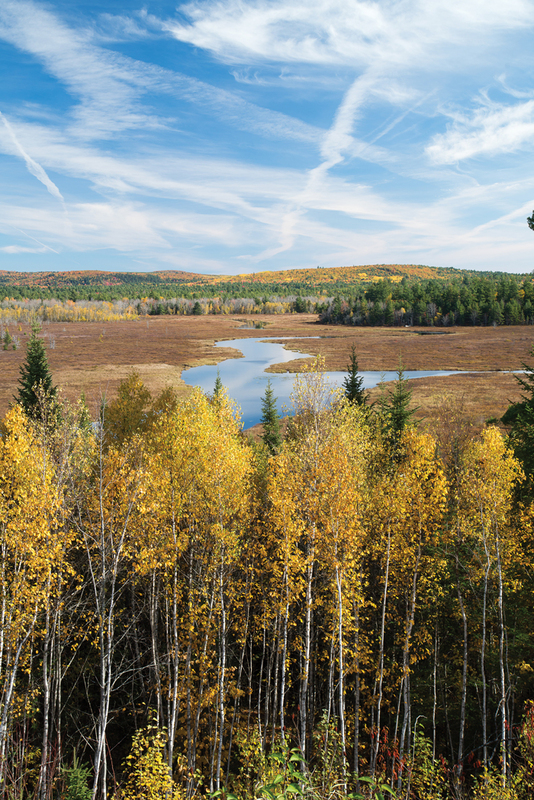 Western Maine’s panoramic brilliance attracts all the traffic, but the coastal forests, postcard villages, and vivid blueberry barrens of Downeast have their own laid-back luster. 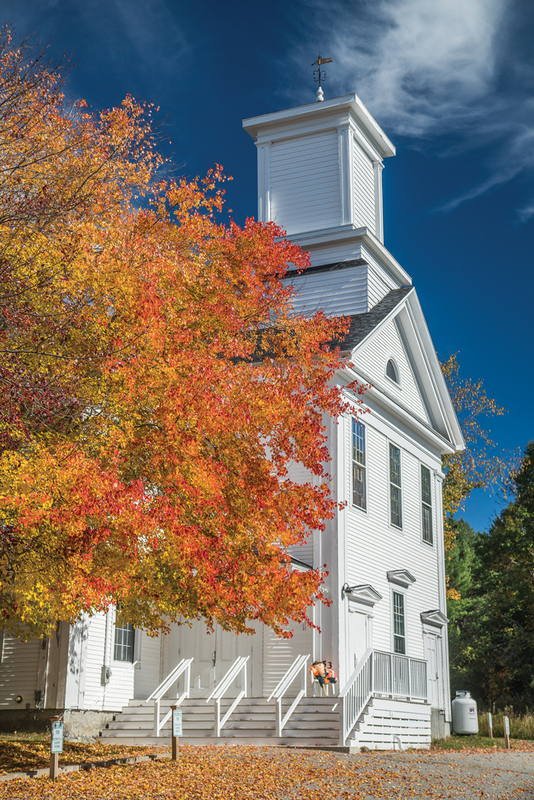 Join photographer Benjamin Williamson on an idyllic autumn road trip. Built in 1850, the former Cherryfield Academy is a town landmark, on the National Register of Historic Places. 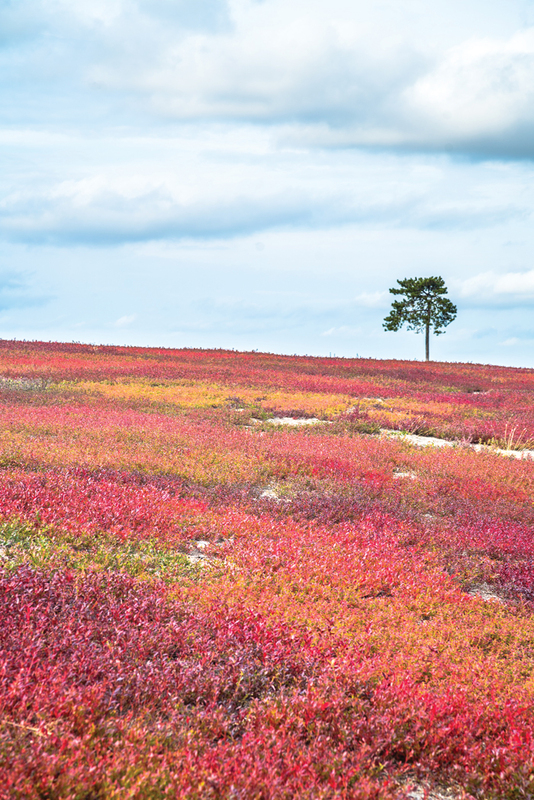 Unraked wild blueberry barrens Downeast, like this one near Franklin, burn crimson in the fall. 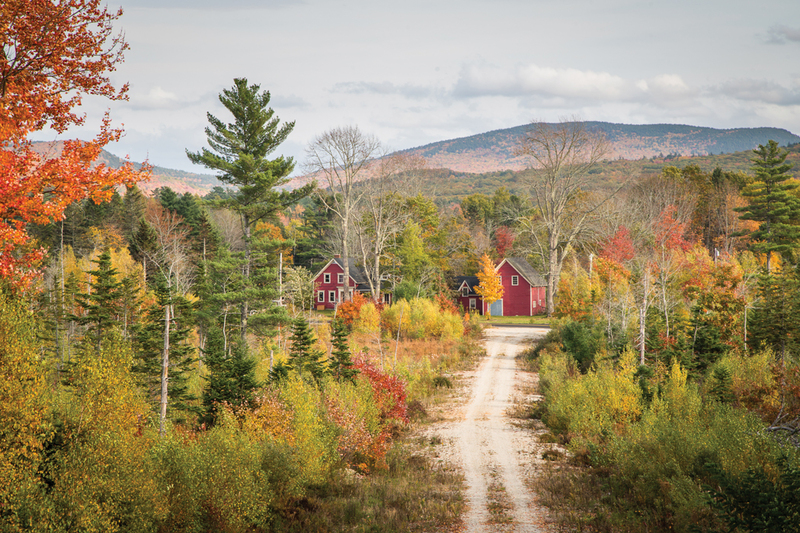 The wild-blueberry country of Hancock and Washington counties is an off-the-beaten-track choice for a foliage tour. Here are some out-of-the-ordinary stops and activities along the way, to match your adventurous mood. You’ll lose track of time browsing at Four Main Street (4 Main St., Cherryfield; 207-546-2664), which displays an eclectic assemblage of antiques and collectibles, including furniture, kitchen gadgets, dinnerware, and odds and ends. While you’re there, take a stroll of Cherryfield village, a National Register Historic District with dozens of ornate Victorian homes. One of the country’s finest examples of Federal-period Adamesque-style homes, the Ruggles House (146 Main St., Columbia Falls) was built in 1818–1820 for judge and wealthy lumber dealer Thomas Ruggles. Meticulously restored, it’s now a museum open for tours until Columbus Day. With a chainsaw for a chisel, Arthur Smith (232 Rogers Point Rd., Steuben; 207-546-3462) has created a roadside gallery of intricately detailed coyotes, owls, eagles, wolves, and other creatures. His wife, Marie Smith, paints the wooden sculptures. 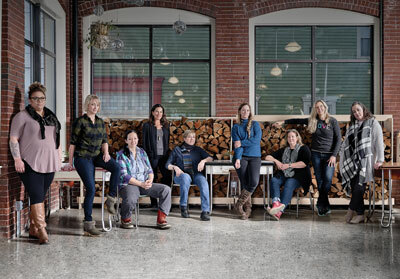 Since taking over the charming Riverside Inn (622 Main St., East Machias; 207-255-4134) in June, proprietor Cynthia McDonough has opened up some of the common spaces, revamped the dinner menu, and added a pub-style Club Room, where lighter fare is served. Sunrise Canoe and Kayak (168 Main St., Machias; 207-255-3375) offers half-day guided sea kayak tours of Machias Bay and canoe tours on the Machias River. Rentals available for those who want to make their own itinerary.  Stretching 87 miles from Ellsworth to Charlotte, the Down East Sunrise Trail passes villages, blueberry barrens, forests, and lakes and ponds. The rail trail is open to mountain bikers, walkers, horseback riders, and ATV riders. 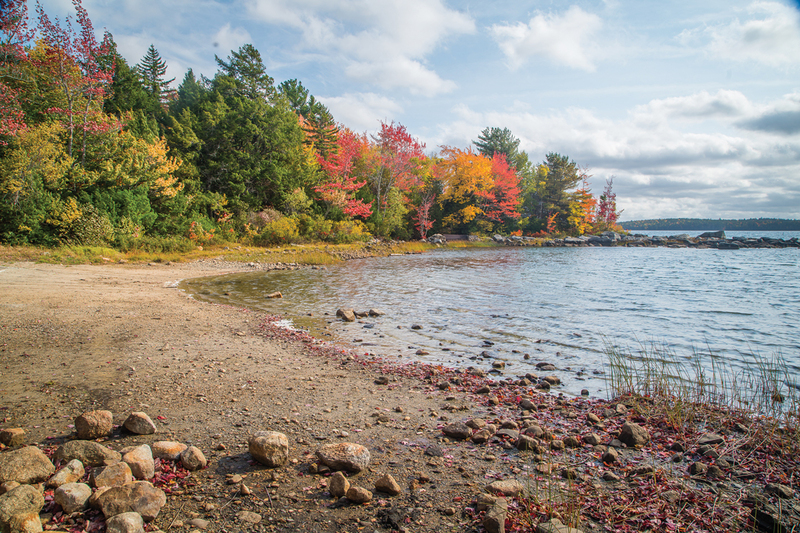 A network of trails laces the forested 14,000-acre Donnell Pond Public Reserved Land (Franklin; 207-941-4412), where you’ll find remote lakes like Tunk Lake (above), mountaintops with panoramic views, and not a whole lot of people. Ambitious hikers should make for the 12-mile Caribou Loop Trail, which summits Black and Caribou mountains. A Downeast icon, Helen’s Restaurant (111 Main St., Machias; 207-255-8423) serves traditional Maine fare like fried clams, steamed lobster, and pot roast. The pies are legendary (needless to say, get blueberry). 44 Degrees North Restaurant & Pub (17 Main St., Milbridge; 207-546-4440) offers good pub fare like nachos and burgers, as well as a nice selection of fresh seafood, including cedar-planked salmon and lemon-caper-dill haddock. 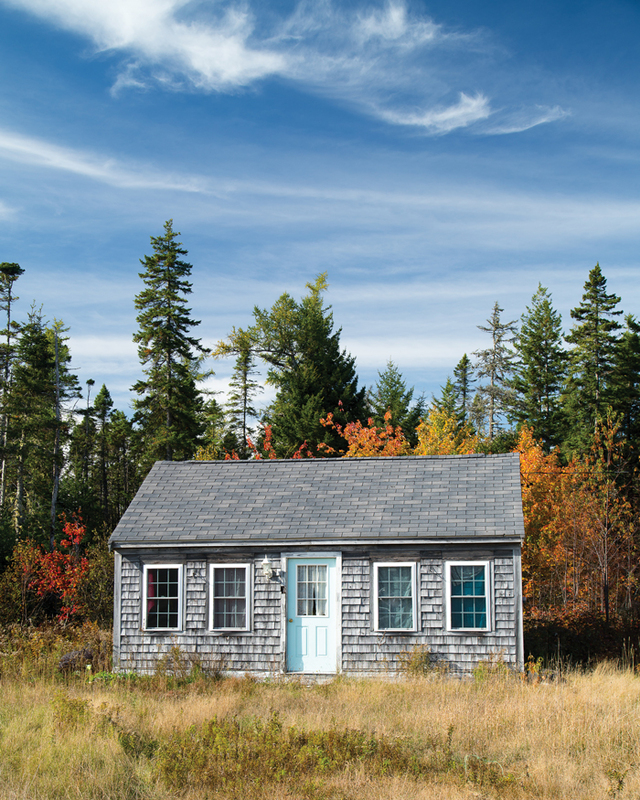 A cottage near Roque Bluffs typifies the Downeast style: low slung,gray-shingled, and unassuming, with tons of charm. An aspen stand shimmers golden along a peaceful stretch of Route 9, better known as the Airline. 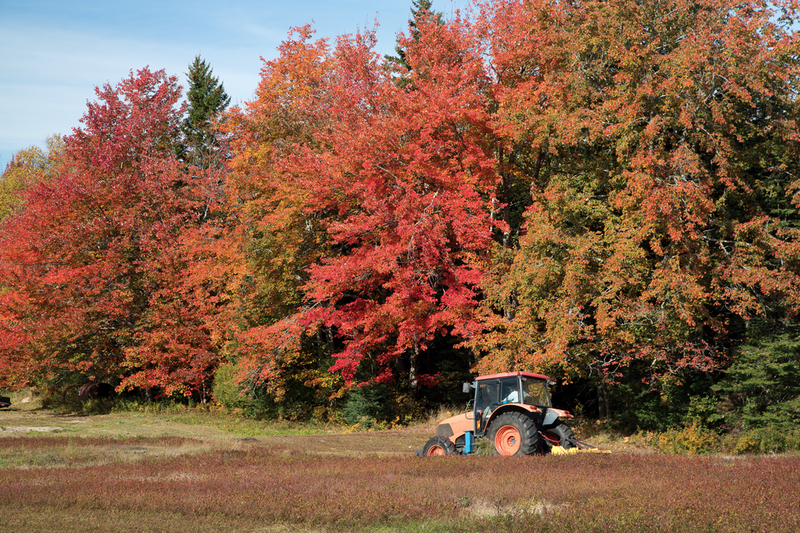 Raked blueberry barrens, like this one in East Machias, turn brownish red after a harvest, providing a burnt, burnished contrast to the foliage. 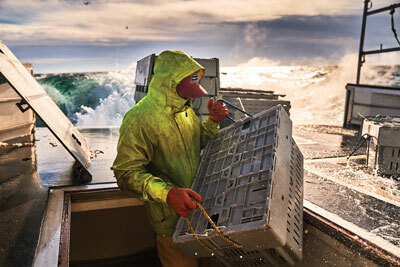 Benjamin Williamson talks about photographing this story. 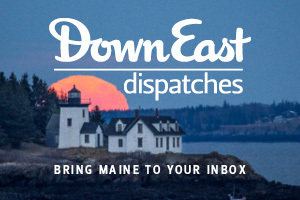 See more Maine travel stories!